This month Jamie Malley of the Allen County Public Library talks about the challenges and joys of running a library-sponsored bookclub. BookBrowse interviews This month Jamie Malley of the Allen County Public Library talks about the challenges and joys of running a library-sponsored bookclub. about all aspects of their book club. Please tell us a bit about your group. We have about twenty on our list right now, mostly ladies in their 50's and up (with probably 7 of those being retired teachers), plus two men - one is a farmer/biologist in his sixties and the other is a retired gentleman in his 70's. We call ourselves Books on the Square because our library is on the town square. It's a small town and we're proud of our square! How would you describe the group's personality? We like to have fun – our discussions are lively and funny. The group is mostly ladies and sometimes it's surprising where our discussions take us. Those ladies are a lot more rowdy than you'd think from looking at them! When and how did the group get started? Back in 1999, I talked to my director about starting a book club (the library didn't have one up until that point) and she okayed it so I started advertising – we're lucky to have a spot in our weekly newspaper for an article covering library news, so I used that and also made flyers to hang up in the library. We had six or seven people show up at the first meeting and maybe one or two of those original members are still with us. But the members we have now have almost all been with us for at least a few years. Some more like six or seven. How did these more recent members find you? Sometimes we get new members from people in the library who, when they find out about the book club, come and try it out and like it and stay. Sometimes current members will bring a friend – and to tell you the truth, it seems like those people are more likely to stay in the group. Maybe it's because they already have a friend in the group when they first start coming. We do have a slight turnover, not as much as I expected, but we'll get a new member and they'll only come once or twice and then we never hear from them again. Like I said, that hardly ever happens. We've got two ladies who've been coming for almost a year and I still think of them as 'new' because the other members are so established. From an outsider's point of view it would seem that it might be more difficult to build a cohesive group when you meet in a public place, do you think this is the case? No, our members are there because they really want to be. And they definitely feel that this is THEIR club! They have a real feeling of ownership. Generally, everyone starts arriving 15 to 30 minutes before starting time and the 'feeder' is there already serving so everyone gets something to eat and drink. Then we all just mill around talking until time to start. The 'leader' gets everyone quieted down and usually tells a little about the author and maybe some information pertaining to the author and the particular book we're reading. All the 'leaders' have different styles – some just talk about the book and characters and some have discussion questions. We usually meet in the library but right now we're in a temporary location while our library is renovated so we're meeting in the staff break room! But we'll have a nice big room when the new library is finished. We usually have people volunteer to be the 'leader' or 'feeder' for a particular month. Sometimes the 'leader' will pick a month when we're reading a book they have a particular tie to – maybe they suggested it or for whatever reason feel they know more about the book or author. For instance, one of our ladies is an email buddy with Silas House so last year when we read one of his books she asked if she could lead the discussion. We meet on the third Tuesday of every month. For the last five or six years, we haven't had a book in December because everyone's busy with the holidays, but we still meet. One of our members very graciously invites the entire book club to her house on our regular meeting day. We each bring a dish and enjoy an elegant meal and we each bring a bookmark for a gift. In between, we mainly communicate by email but we do have a calling list as well. How do you go about selecting books to read and, presumably, finding enough copies in the library for everyone to read? Our members all give me a list of books they'd like to have chosen for the next year and I make up an annotated list and then they vote. I count the votes and the book that got the most votes is the next one we read and they go on down the list from there. When we first started the group we had a few who liked to buy the book each time but for the most part, they've stopped that now. Our Interlibrary Loan librarian borrows as many copies as she can from other libraries and then our book club members share them; and if it's absolutely necessary, we'll purchase a few extra copies. Our state library recently made available book club kits with several copies of a book plus a large print and an audio – so we'll be using that service in 2008 for a few of our selections. Do you think it's possible to have a "one size fits all" book club for such a diverse group as library patrons? Is there a particular group that you hoped to attract to the book club? Most of our club members agree that the whole point of being in a book club is so that you'll read some things that you maybe wouldn't read on your own. So I think the diversity that comes from lots of people choosing the books is a good thing. The only type we've ever tried to attract is the type who likes to read! Do you have plans to start any more library book clubs? At the moment we have just the one book club. We've offered a men only book club because it seems most men who want to be in our club end up saying we read too many 'chick books', but we only had a couple of guys come to the men's club so it disbanded. At some point after we move to the new library I'll probably try a teen book club and maybe a certain genre group – like just mysteries or science fiction. What's your favorite thing about belonging to/running the book club? My favorite thing is the opportunity to talk to other readers in depth about what they like or dislike about certain books and about what an author might mean in a particular book. So just getting an explanation or maybe validation for myself. You're job title is Community Relations, what does that entail? When my job title was given, I was writing our weekly newspaper article, going out to groups like Rotary and other community groups, and doing public relations for the library. My job has evolved over the years and the title never changed. What I do now is actually mostly teen oriented. I create teen programming through the year and for summer reading: I run our library Myspace page and order teen books. I also work the front desk and fill in with children's programs. Anything that requires 'getting up in front of people' usually falls to me since I'm the only one here (with the exception of our director) who isn't afraid of public speaking. Are you also involved with "Friends of the Library"? Is there an overlap between the two groups? Yes, I'm also the liaison for our Friends group. There is a huge overlap. Almost everyone in the book club is also a Friend – but we have lots of Friends who aren't book club members. Although not strictly relevant to our discussion about book clubs, I'm fascinated to know what percentage of your patrons you would say are "heavy users" of the ibrary? I imagine it's the 80:20 rule with 20% of the patrons accounting for 80% of the book loans/activity within the library? That sounds about right. We see lots of faces every day but it does seem that a big percentage of those faces are the same ones over and over again. Tell us about the sort of books your club reads. We try to pick at least one biography and two non-fiction books a year. We try to keep away from religion and politics, because they tend to lead more to arguments than discussions. Usually controversial subjects make for good discussion. Also, characters who make unusual choices – then we can argue about the 'right or wrong' choice. Could you tell us a few of the books that have generated the most interesting discussions. Back in 2002 we read Harry Potter and the Sorcerer's Stone because several of our members were upset about what they thought it contained. The discussion was really good because reading the book totally changed what many of them thought about the series. The Awakening by Kate Chopin was a lively discussion because it was full of controversial subjects like sexual preferences, suicide, and women's rights. The Rosewood Casket by Sharyn McCrumb was a good choice for us because of all the Appalachian legend and lore. We're located I guess you could say in the "foothills of the foothills" of the Appalachians, and the members of our group are interested in the heritage aspect of 'local' literature. We had the author visit when we discussed The Illuminator by Brenda Vantrease so that made for a more interesting discussion than usual; and The Kite Runner by Khaled Hosseini was a timely book for our group and helped us understand more about the Middle East. Popular books that are just fun to read usually don't make good discussion books because everybody pretty much just says, "Yeah, I liked it", "Yeah, it was good". That's something we've heard from many book groups - it's really important to pick books that have some 'meat' to them! After 8 years reading together, you must have covered a lot of ground. Do you feel that your discussions have developed over time? Yes, at the beginning, we didn't really know what we were supposed to be discussing so the discussions were mostly about how we felt about the story. We still talk a lot about how we feel about the stories, but we also talk about the writing more, about the technical side of the writing. I've found that some groups who've met for a long time sometimes start mixing things up a bit with regard to what they read discuss – e.g. each reading a book by a particular author and discussing the author him/herself as opposed to a specific book; or reading through all the works by a particular author, or reading on a particular theme for a period of time. Have you tried anything like this? So far we haven't done anything like that but now that you've suggested it we probably will! One thing we have done is watched a movie and read the book and then compared the two. Have you organized any special events together? We used to have a man in our club who is a playwright (he moved to Texas so we don't get to chat with him anymore, unfortunately), but he wrote a play that was presented at Horse Cave Theatre, in Horse Cave, KY and our group went to see it. We've had Brenda Vantrease who wrote The Illuminator at our discussion of that book, and we plan to read her second book, The Mercy Seller, in 2008 and she's agreed to come to that discussion as well. Several of our members attended an author visit at Barnes & Noble in Bowling Green when Sharyn McCrumb was there and the same with Silas House. 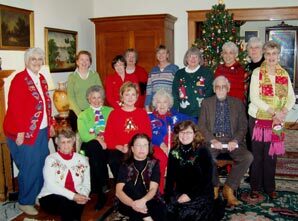 Every December we meet at one of our book club members' house for a Christmas luncheon. What would you say would be the ideal book club? I think our book club is just right. Is there anything you'd do differently if you were to set up from scratch again? The only thing I might change is that it might be better to meet in the evening because we meet at 1:00 pm and there are lots of people who might like to join our club but can't because they work. Our time slot probably has a lot to do with our group being mostly retired ladies, too. Any learning lessons to pass on to others? Just to make sure that you can get enough copies of a particular book. It's usually a good idea to choose something that's been out for a while, especially if you have to buy copies, then you can get paperbacks. Issues that seem fraught with peril for our group are religion, politics, and race. Having members of the group take turns being leader really makes them see what it's like, and that helps them to have some respect when someone else is leading the group. It's easy to sit back and say how much better it could be when you've never done it. But our group is really good about not criticizing and with helping each other out. Having a call list or email list is a very good idea so that we can communicate with each other between meetings. Thank you very much Jamie, we wish you and Books on the Square many more happy years reading together.